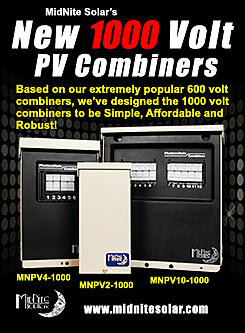 Why Does MPPT Matter In Solar? Why Does MPPT Matter In Solar is discussion about MPPT charge controllers in general not MidNite Solars charge controllers. MPPT control already reduces wasted energy by operating the PV solar module at its higher MPP voltage and lower MPP current, instead of the lower power obtained by connecting the PV directly across the battery terminals. The higher voltage additionally helps to keep copper losses (and price) down, especially when the PV wire runs are long because the current is lower for a given amount of power. Raising the controller PV voltage limits higher allows more PV modules to be added in series which gives some buffer for when one or more modules become shaded by trees or poles which lowers the MPP voltage and brings the string voltage dangerously close to (or lower than) the battery voltage. We want to keep the MPP voltage above the battery voltage as much as practical and not necessarily have to pull out our chainsaw. Now we have MPPT controllers that run up to 600V DC input, which is handy when you have extremely long PV wire runs or maybe you would like to use your existing grid-tie PV array to charge batteries for backup power. Many do not realize that when the grid goes away, so does the usefulness of their expensive grid-tied array. Why not put that investment to good use and keep the lights on without having to run a generator? MPP tracking efficiency has also improved to almost 100% accuracy. Algorithms that can quickly scan the entire I-V curve of the PV array from battery voltage up to Voc (Open Circuit Voltage) ensures that the correct MPP “bump” is chosen from multiple possible power points with as little time away from the correct power point as possible. Communications with other controllers, the rest of the system and the Internet is becoming common place. So are standardized communications protocols, such as Modbus RTU and Modbus over TCP/IP. This ensures that one half of the system knows what the other half is doing, such as coordinating battery charge stages. Even though the price of PV has dropped significantly, there is still room for wind and hydro power in those places where the sun doesn’t always shine. Small wind systems can benefit from MPPT controllers with the proper tracking algorithms to let the generator spin at its optimum RPM at varying wind speeds. Power increases of around 250% over non-MPPT are common during gusts and somewhat less at average wind speeds. Wind and hydro also normally have longer wire runs to the battery room so the higher input voltage further reduces losses. Battery charging algorithms are now smarter to improve battery life. If your off-grid home only partially discharges the battery bank, instead of doing a complete daily absorb charge cycle (raised battery voltage), the controller can be programmed to only do this once every few days or when the state of charge falls below a certain point. Full charges must still be done to reduce battery plate sulfation but less often is evidently better if possible. For European "Self Consumption" energy programs, Bi-directional MPPT controllers can up-convert the energy stored in the batteries to send it out the PV input terminals. A compatible grid-tied PV inverter connected here can sell back AC power and fill in for time of day peak grid usage times. Then the controller can charge the batteries back up again, ready for the next day.